I chose to sew layout #3 from yesterday's post. If I had been making it for myself I may have sewn layout 1 or 2 but this quilt will be a gift quilt. When I am gifting a quilt to someone I usually pull 3 or 4 quilts and let them pick their choice from them. Most people choose "safe" layouts rather than whimsical or arty layouts. Some people like order and repetition and a more modern look. I have found that a lot of people find my quilts to be too bright and the layouts too wild. And then there are the rest of you who love my quilts with their 200 (or more) different fabrics and layouts that make you look twice at them. My main computer died yesterday. I realized about 3 weeks ago that something was happening to it so I started transferring all of my photos, documents and my email contacts list to my smaller computer that I have in the basement. I already miss it because it was still Windows 7 and now I'm stuck with Windows 10, a learning curve that I'm not enjoying. I follow you daily using Feedly, and I love your colors and whimsical layouts. You are an inspiration! I like the orderly layout, too. I've been suffering from W-7 withdrawal, also. W-10 not only looks different, but seems to have a few bugs -- or it could just be my Surface. I'll admit to using a few bad words and wanting to bash the computer. I still have a Win7 laptop.... in the studio.... but it is slow... so I use my Win10 the most. For file saving, I set us up a NAS (network storage) that all the computers connected to the network can save to. Now I just have to save to the Network Drive... and everything I want to keep is there!!! I liked the 1st layout best as well!!! The quilt looks great - very modern. I hate computer issues. Technology is great when it works! I am sorry to hear that your computer died. I know how frustrating that can be. When my Windows XP computer got mysteriously corrupted, I decided to switch to a Mac. I was surprised that while there is a bit of a learning curve, it wasn't as bad as I thought. When my Mac laptop got too old and slow, I bought a PC because it was so much cheaper. With Windows 10, the learning curve was so steep that I estimated about 20 hours to get proficient and up to speed. I had used 7 at school, but 10 was unnavigable. I decided to give the laptop to my daughter as hers was limping and I bought a refurb Mac laptop from Apple and just got going. I did not want to invest so much time in something just so I could use it. I would rather sew. Wanda I am not enjoying trying to learn windows 10 either, I had to start to learn that one about a month ago and I am having a hard time with it - getting photos off of my camera and on to the computer was and still at times is a headache - good luck! Good morning Wanda...I agree with Gene regarding the feel of floating blocks being strongest in this layout and, for that reason really love this layout. I went from Windows Vista to Windows 10 in May, and don't think I will ever get used to it, or learn 1/2 of what it's capable of doing, but that's ok. Enjoy the day, and tomorrow those delightful 70's are supposed to return, for a few days anyway. Yeah!!! I can feel your pain about Windows 10!! I loved Windows 7, hated 8, and barely like 10. I wish they would leave it alone, ready to go to Apple, but I hear it's so different. I love my I Phone by Apple so I guess I just Need to take the jump. BTW, your quilt is beautiful. Thank you for mentioning how you gift quilts (let them choose from several). 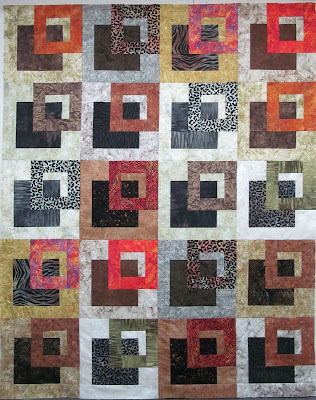 When I first started quilting I wanted to make all of my nieces and nephews a quilt. I started with the oldest and worked my way down. For the oldest nephew, I didn't know his tastes at all so I asked his mother and she said his favorite color was brown. This was horrible news to me! From then on I've managed to steer away from the "favorite" color question and stick more with the "what three colors would they least like" because I want to sew (in my spare time) on fabrics and colors I love. So far it's worked out well but your idea is even better. Great finish! I feel your pain over the Windows 10. I'm not sure whose idea it was to come up with Windows 10 but it was a bad one! Very interesting about people's choices. Before I started reading your blog I would have selected safe. Now I'm making a tote with Kaffe fabrics as a gift and someone commented that they hoped the recipent was a wild person. Thank you for opening my eyes. I'm using W10. I leave my desktop as a "normal" desktop. That helps. Good luck. I am holding on to Windows 8. It took me a long time to get used to it and I do not relish change any more than the next fellow! Windows 10 is supposed to be much better. I'm sure you'll enjoy it once you get familiar with it. Playing safe is good. It looks wonderful. I sympathize with you. My computer had to be fixed a couple of months ago and they had to put 10 on it. UGH!!! Great post about gift quilts and people's habits - I have observed the same things when recipients are given a choice. And a p.s. to Linda S - I tried to go back to a PC after using a Mac. WRONG. I gave the PC laptop to my husband and bought a new Mac Mini. While I know how to use both (I had a PC at work for years and years and years), I am a Mac girl at heart. Wanda, a quick tip about Windows 10. Keep the regular desktop setting, for starters. Turn off Cortona (or whatever she's called). Have someone help you, if you aren't sure how, place icons to your favorite/most used things back on your desktop instead of in the strange menu thing (then you never have to use the strange menu thing). Also, if part of what you miss is Windows Live Photo Gallery, if you search for "Live Photo Gallery Win 10" it should take you to the Microsoft website, where there is a free download of a suite of stuff that includes Photo Gallery. It was very easy to download and install (but I had my kids place the icon in my little bottom tray thing on the desktop, 'cause I couldn't find it afterwards) and then I can import, edit, store/sort my photos just like normal. That was the most frustrating part for me, so just thought I'd offer the tip, as I know you also do a lot of photo storing/sorting. Once I've done all those things, I don't even notice anymore what version of Windows it is. But it did take my kids helping me arrange everything first. Best of luck to you! 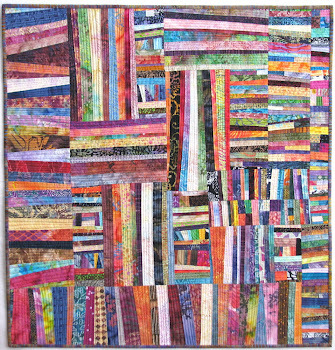 I love your colorful quilts and whimsical or unusual layouts. I especially like when you show your thought process of laying them out and what you think works better and why. Good luck with Windows 10. At least you don't have to deal with the dreaded Windows 8. I love this quilt! I like how you can make so many fabrics sing when you put them all together!!! Just to complicate your life, you should also get a MacBook - ha! I agree about the quilt gifting. I notice that the quilts I "learn" from making and that appeal to me are not the quilts that people want in THEIR homes. Also that they want to match the quilt/hanging colors to their room - funny! As much as I love quilts, I'll be happy to make my own because I've seen so many online that I wouldn't be happy to look at anywhere, let alone in my home. But of course I've seen dozens--hundreds?--I'd love, LOVE to have, including at least 95% of yours. Good thing I have limited space and money! I love your quilts. Your sense of color is awesome. I use a lot of bright colors in my quilts too. I am especially fond of lime green. You provide your followers with so much inspiration. I'm pleased with your choice too. Modern look is growing on me, but don't stop using many fabrics/colors, or being bright! I do like this layout, the colours are just right for Stonehenge! You know I'm one of "the rest of you" who goes for for the more fabrics and more colour scenario. I've been using Windows 10 for about 2 months now. I'm very happy with it and there are a couple of things I really like about it. Hopefully you will get used to it and like it as well. Another very warm today and rain expected at the weekend. 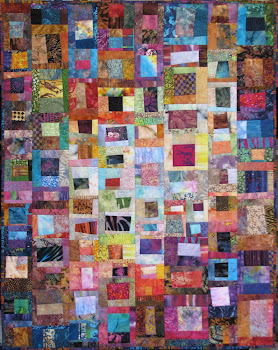 You're so kind to follow - and even solicit - the wishes of the recipient of your quilt. I find that so hard to do! When you originally wrote about several different layouts, I thought you were just going to move the blocks around, to adjust the color placements. So I was delightedly surprised to see the different layouts with the blocks turned and the fun differences it made. Of course, I hadn't even envisioned or thought of any of those possibilities! So it's a bit disappointing to see you go back to the predictable setting. But you're undoubtedly right that it's wise to make sure the recipient will like the quilt. I tend to take the approach that he or she will like it or grow to like it even if she/he wouldn't have picked it. Just because you've never seen something before doesn't mean you won't like it. Of course, that isn't always the case, but I HAVE to enjoy making it, and if I'm making what others like or want me to make, that doesn't work. I need to make what I feel like making. I know that sounds like a prima Donna, but that's the way I have to work. I really don't like making things at the request or prescription of others. I don't mind using a pattern or even at times a kit, but it has to be picked by me, what I feel like making at the time I want to make it. If that's the case, I don't mind ever doing it or giving it away when it's done. But the joy of making goes out of it for me if I don't get to choose what or how to make it. And by the way, I've been in Denmark for a month visiting family. I've still read your posts but have to often around to commenting. I've had spotty internet access, often delayed by a couple of days, so I figured it would be more confusing than anything! But I'm finally home and trying to catch back up on sleep, laundry, and all kinds of other stuff! So I'm back in your blogging life! I don't like Windows 10 either, it's a good thing you backed up the important stuff!